“You exaggerate more than anyone in the whole world!” If you have ever taken part in a disagreement that escalated into extreme statements such as this one, then you know how hard it is to come to an agreement once either or both parties become polarized in their thinking. One metaphor that helps to explain dialectical thinking, the foundation for DBT (Dialectical Behavioral Therapy), is Walking the Middle Path. If you walk away from DBT with one mindful tool for profoundly enhancing interpersonal relationships, this is a good as any! To Walk the Middle Path means replacing “either-or” thinking with collaborative “both-and” thinking. Too often, we make up our minds about how we feel about something using a black and white, all or nothing, decision-making construct. When we do this, we run the risk of being out of balance – not giving deserved validation to another way of thinking. When we disagree with someone, it may be natural to believe that they are wrong and we are right. But is this necessarily how it is? Not if we take a dialectical approach to our thinking, appreciating that there’s always more than one way to view something. When we replace “either I’m right or they are right,” with “I’m right and they are right” – then we can see each perspective as an opinion rather than an absolute truth. When we Walk the Middle Path, we make room for compromise. When that compromise validates our own feelings and those of another, we are on the path to a more harmonious outcome. Consider the results of extreme thinking. Often times, it leads to extreme feelings – either too emotionally invested or “checking out” completely, due to frustration. Sometimes extreme thinking causes us to become too rigid or too loose. In other words, we make too much of a situation or too little of it. Conversely, acceptance and change are most available when we choose to Walk the Middle Path. In doing so, we become unstuck. We gain flexibility, so that we can value our own perspective in proper balance to the opinions of others. 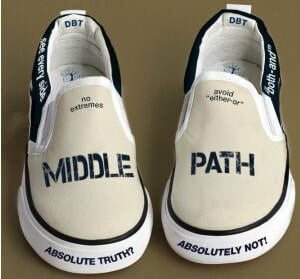 Walking the Middle Path creates the type of open-mindedness that facilitates fairness and respect. Quite simply, it’s a powerful mindset for creating peace and contentment.